We were the third generation to inhabit this space. During the 70′s a bunch of artists moved in. In the 80′s some musicians and film people moved in that knew the artists. In the 90′s a biker that knew the musicians and film people that knew the artists moved in. The stage was set. The 90′s were a whirlwind of bikes, music, film and art in the hood. Minneapolis was a hot spot in the alt music world during that time. Bands from all over the country passed through the 2nd and 3rd floors of 117 Washington Ave N, and a lot of good music came out of this building. It was a really good time. From 1993 to 1998, Minneapolis had a run of professional bicycle races come through town with the Norwest Cup and the NORBA NCS races. At the time, California, Colorado and New England were the cycling kingdoms. This all changed when professional cycling came to Minneapolis. We were tired of all the talk. While they were talking, we were doing. So when the pros and the companies that sponsored them came to town, we showed them what cycling culture was all about. Our riders never won the races, but we did win the hearts and minds of the pros, and the bicycle industry people that support them. We know how to throw an after race party for 300 people and not get busted by the police. We know how to get certain un-named pros back to their hotel or to the airport after a hard night. People saw that we had more fun and less talk, and they liked that. We showed them that you don’t need a mountain or an ocean to ride a bicycle and have fun. In March 2019 we said goodbye to our longtime home in the warehouse district for a new home next to Minnehaha Falls. Get ready for OOOBS 2.0. Bicycles are freedom, get some. Ever wanted to hide your ankles from people? Dreamt of matching up that OOOBS trail jersey? Enjoy earth tone camo patterns? Our new camo trail socks are the key to your joy. Handlebar bags, seat packs, phone holders, you name it, we stuck ours on it! Rep your favorite downtown hooligans wherever you go with this durable, affordable gear from Banjo Brothers. 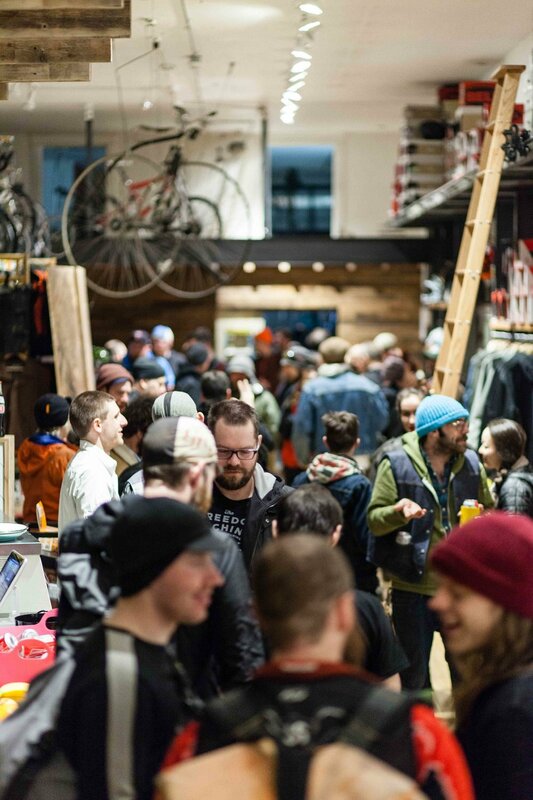 For over a decade, we've been throwing art shows, demo days, impromptu DJ sets, weekly Tuesday Night Rides, and races (sanctioned and otherwise) here at the shop and around the Twin Cities. Check out our event calendar to stay up to date on what's coming up. Our number one goal is to get you out there riding. Whether it's riding city paths or ripping downhill lines in Moab, we've got what it takes to get you there. We also want you to be a part of the greater cycling community, which is why we are constantly organizing events to bring everyone together.